Issue could be related to a possible battery fault. Apple has confirmed that it is investigating reports of two iPhone 8 Plus handsets which reportedly burst open — one while being charged, and the other while out for delivery to its buyer. Apple told the U.K.’s Independent newspaper that it was “looking into” these incidents, but declined further comment. 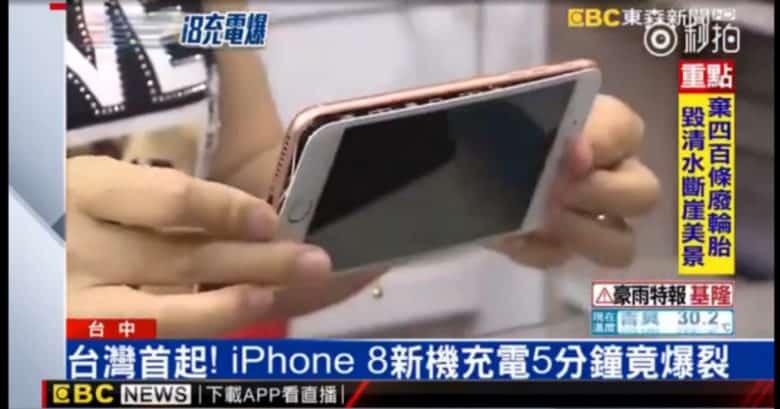 According to Ms. Wu, the Taiwanese owner of one of the the iPhone 8 Plus handsets, the split happened just after she put her handset on to charge. Three minutes later, the front panel of the 64GB rose gold handset began bulging, before lifting completely away from the rest of the device. The phone was shipped to Apple so that experts there can assess the cause of the damage. The second report comes from Japan, where a customer claims their iPhone 8 Plus arrived at its owner’s home in the same state, with the display having separated from the rest of the body. While it’s not clear what the cause of these problems may have been, an unconfirmed rumor doing the rounds claims that the iPhone 8 Plus battery is made by Amperex Technology Limited (ATL), the same company which built the battery for the ill-fated Samsung Galaxy Note 7. That particular handset caused Samsung no end of trouble — including causing the evacuation of a Southwest Airlines flight after a passenger’s Note 7 emitted a thick grey-green smoke and burned a hole in the plane’s carpet. Samsung wound up recalling the handsets, after tracing the problem to an issue with the handsets’ lithum-ion batteries. Apple has yet to comment on the story, but we’d suggest taking everything (including the alleged battery link) with a large grain of salt for now. Even if it does turn out to be an issue with the handsets, it’s not clear how widespread a problem it may be. This isn’t the first issue Apple has had to deal with concerning the new iPhone 8 handsets. Last week, Apple acknowledged an issue with several iPhone 8 and iPhone 8 Plus models, which make a distracting “crackle” or “static” noise during calls. Apple has said that fault will be fixed in a later software update. Update: This article was updated to reflect Apple’s response.